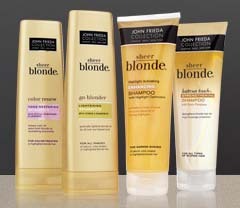 Get a free sample of a John Frieda hair product of your choice from Kroger (look for your grocery store or state below). You can choose from: Luxurious Volume Root Booster, Frizz-Ease Dream Curls Curl Perfecting Spray, Sheer Blonde Highlight Activating Enhancing Shampoo/Conditioner, Frizz-Ease Straight Fixation Smoothing Creme, or Root Awakening Strength Restoring Shampoo/Conditioner. Thanks goes to Free Stuff 4 Free for sharing! You should receive your sample within 8 to 10 weeks. love free samples, like John Freda products!!!! FREE YES!!!! Krogers isn’t in PA because of PA’s labor laws…in the 1960’s they used to be…. Thank you for showing that it’s not just the states from “Kroger” that can request this.